What are we watching, if not TV? Reports surface every week that hail the demise of TV and highlight the shortcomings of cable networks. However, it’s important to note that these trends are merely symptoms. They are symptoms of a larger, cultural change spearheaded by the generation of yours truly—the *in James Earl Jones’ voice* millennials. We are consuming more than any other generation and are, as a result, reshaping digital consumption and the future of video production, as we you know it. Habits are hard to break, but if an alternative to your habit is presented, you find that it’s easier to shift gears—pivot, if you will—and form new habits. Our habit of being a couch potato and tied down by our DVR has nearly come to an end. Don’t get me wrong, we still want to consume the same, if not more, content. We are just extremely adept at finding streaming it from various places/applications via two, maybe three, screens. Let’s take a deeper look at my generation, an even younger generation, and how our changing habits are transforming the broadcast and pay TV world, as you know it. One study found that 39 percent of millennials us frequently binge watch shows over streaming services compared to only 16 percent of non-millennials. Unless it’s The Walking Dead—then even we might head on over to AMC. Overall, though, it’s safe to acknowledge that live TV viewing habits are being preempted by the increasingly available opportunities for individuals of all ages to tune in to the show they actually want to watch. The phrase “Channel surfing,” will soon be replaced with something more applicable that finds its way into Urban Dictionary. Broadcasters, Multichannel Video Programming Distributors (MVPDs) and even production studios are living in the age of the viewer. And, believe it or not, the more empowered the viewer gets, the more (cable) cords will be cut. New studies found that both generations, Y and Z, are watching less broadcast television as it airs. Here’s a handy graph from Forrester to illustrate the quandary. If you haven’t acquainted yourself with the term “cord-never,” it’s time. Also known as “broadband-only,” us adaptable problem solvers have maneuvered ourselves into a mighty fine, app-based, viewing experience—all streamed via IP. 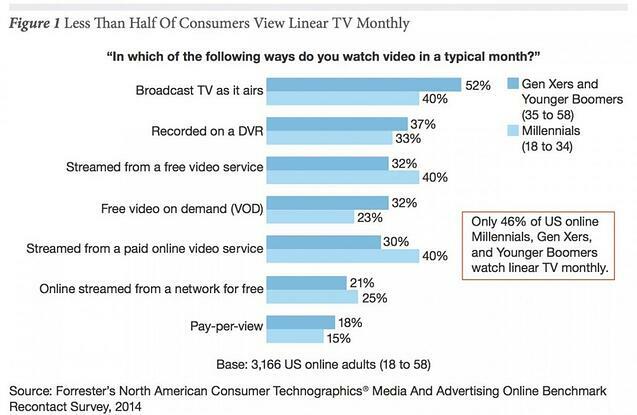 In addition to consumption patterns, you’ll also see a change in video production. With the advent of the 8mp digital camera, iPhone and Adobe’s Creative Suite, YouTube provided the perfect platform for creatives to share well-produced short-form content for their peers to watch, share and obsess over. As you can expect, the cream of the crop rose to the top and were quickly harnessed by YouTube’s Multi-Channel Networks (MCNs). This trend paved the way for videolebrities. It’s safe to say that these generations don’t follow—literally, on Instagram, Snapchat or Twitter—A-list celebrities like Tom Cruise, Anne Hathaway or even Angelina Jolie. They do follow, spend every penny of their allowances and avidly ‘fangirl’ over YouTubers, Viners and Snappers like Joey Graceffa, Brent Rivera, PewDiePie and Lele Pons. In 2015 alone, there have been a minimum of five conventions held, including the Streamys, an awards show dedicated to this web-based perfection, that embraced the culture of the Maker. So, what’s so impressive, or important, about today’s Makers? Today’s Makers are opinionated, well-versed in the trending topics of the world, socially savvy, connected and transparent, talented in their vertical, brave and innovative enough to produce content only production studios had previously owned. They are extremely adaptable and have sought news ways to distribute their content via the Internet. Fans, in turn, are consuming their content on any Internet-capable device. 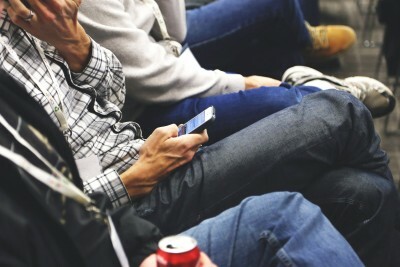 The increase in mobile consumption of digital content will increase by 23.3% in 2015 and by 19.8% in 2016. In addition to entertainment, Makers are tackling the news. Take TYT Network and Newsy, for example. These networks command millions of online viewers and consistently share breaking news in a way that their fans appreciate. So, all that being said, what does the future of TV hold if in-demand digital content is primarily being streamed over-the-top (OTT)? What we need to do is provide one portal that seamlessly streams each type of content, available anytime, anyplace. As such, Xumo has developed a connected TV technology platform (the Xumo Platform) that provides advanced content services to device manufacturers, developers and content producers. The Xumo Platform can power both OTT broadcast and Video-On-Demand (VOD) white-label solutions with dynamic content recommendations and social functionality. Leveraging technological advancements through which living room devices have become both connected and aware, Xumo offers multiple ways to reach and engage with consumers within the home.